We have a problem here. A serious one. Select a tree in your house and ask a employee from a sawmill: what would be the cost if he were to cut the tree and sell it for you? He’d say Rs.X for the sale and Rs.Y for the cutting charges etc. And that’s the value of the tree. Now ask him or anyone else: what is the money value of the benifit to the society if it were to be left alone. You will be left with blank stares. We have learnt that the most important function of a tree is to take in carbon dioxide and provide oxygen, which is responsible fot the life of the entire animal kingdom. So what’s the money value of that? The answer is that we simply didn’t consider that in our economics. Our economics only cared about consumption of the tree for producing goods or clearing it to make way for cities. And that narrow mindedness is where we’re having trouble when dealing with environmental issues. Economics simply hasn’t taken into consideration the environemental effects. Lets extend this to renewable energy and fossil fuels. The fossil fuels based power plans and vehicles are cheaper than renewable energy ones. Commercial rates of electricity in Tamil Nadu is Rs.7/KWh and is mostly produced by coal powered plans. If it were to be replaced by solar power plants, then the cost would be Rs.15-Rs.20KWh (and higher for standalone rooftop solar systems). If one were to look at the economic point of view, then it would make perfect sense to stay with coal powered plans. Again. What are the factors that we did not consider? Did we consider the problems caused by emission of carbon dioxide and other harmful gases/particles? CO2 causes global warming which has been causing cyclones to become more and more severe each year. But the average railfall keeps falling. So, the total cost of power produced by coal is Rs.7+Rs.X and it is very difficult to model and bring about the value for ‘X’. But our scientists tell us one thing – if we don’t do something soon then global warming will go out of control and lead to horrible disasters. This economic paradigm which we live in needs change. It is incompatible with the environment. To find what you want in life seems like tough job to me. Especially when parents make most of the decisions and leave very little for you do decide. While parents decide the best for their wards and thereby put them into a fail safe path for a settled life, I feel that it can become boring after sometime. What true happiness is there in fulfilling the dreams of your parents and forgeting your own dreams? Will you make your kids to live the unfulfilled dreams of yours? There are cases where however, when trying to fulfil the dreams of your parents can break you. When you do something which you don’t like at all, your mind automatically shuts down and does not operate at full potential. You will have to drag it along to make it work. You may not suceed in the case. You may not know what is need in life, but there are things which you don’t want. My experience with this situation was at XII standard. I didn’t know anything about the future and I was just living the moment and studying the subject which I liked the most – mathemetics. Followed by physics and chemistry. However, my mother often forced me to study biology to become a doctor. I wasn’t very interested in biology and certainly trying to live my mothers dream was taking a huge toll at that time. So after somtime, I silently gave up studying biology seriously and put all my effort into styding mathemetics, physics and chemistry – for I was quite a above average performaer and the public examination and entrance examination demanded exceptional performance in order to get into a good college. My secret plan paid off – the maths entrance examination was the toughest paper every seen and my performance was excellent. The final ranking for engineering admissions was something I never dreamed of before and I got the 2nd best collge in Tamil Nadu. This post is dedicated to my fellow comrade. On the first day, I connected my laptop to the inverter. 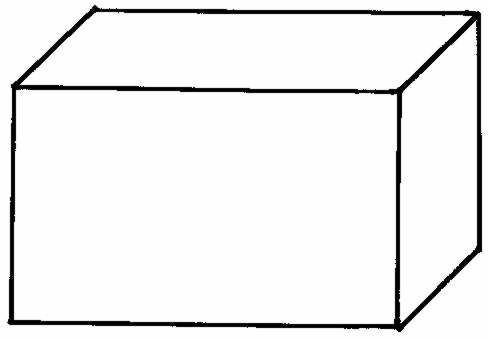 Here is the schematic for your reference. 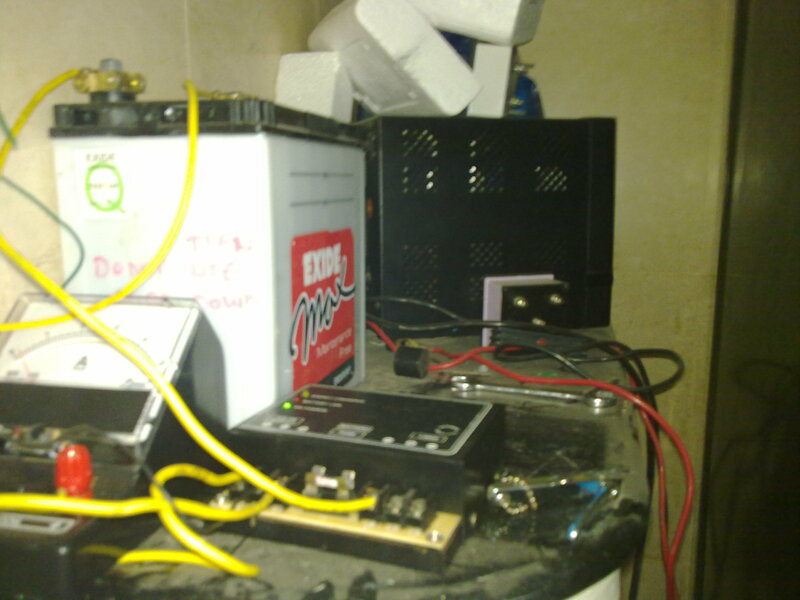 The battery lasted from 6:50PM to 10:40PM after which the inverter gave a low battery beep and shutdown. I checked the battery voltage and it was high at 11.72V. I thought that the inverter was behaving funny and needed to be checked. The next day, I charged the battery with the solar panels to full(or I thought so) and connected to the load in the night. I finally discovered the problem today. I was using fairly long wires to connect from the battery to the inverter(5m approx) and there was a considerably voltage drop on the wires about 1V! When the battery had 12.38V across it, the inverter had only 11.51 V across it! Measured the voltage at the battery as well as a joint I made with the wires from the battery and a wire from the inverter. Just look at the differences below! If the load were heavier, naturally there will be more voltage drop across the reistance of the wires (V=IR!). After this, I brought the inverter closer to the battery and shortened the connection drastically. The inverter was able to operate for some more time. I connected an ammeter (unfortunately an AC one which gave inaccurate results for DC) in the battery-inverter wires and found that the inverter consumes about 1A of battery current even while no load is connected. The laptop consumes another 2A and the total load is about 3A. Hence with laptop, 33% of the power(12W) is going to keep the inverter in operation. #3 Resistance of the wires connecting solar panel. 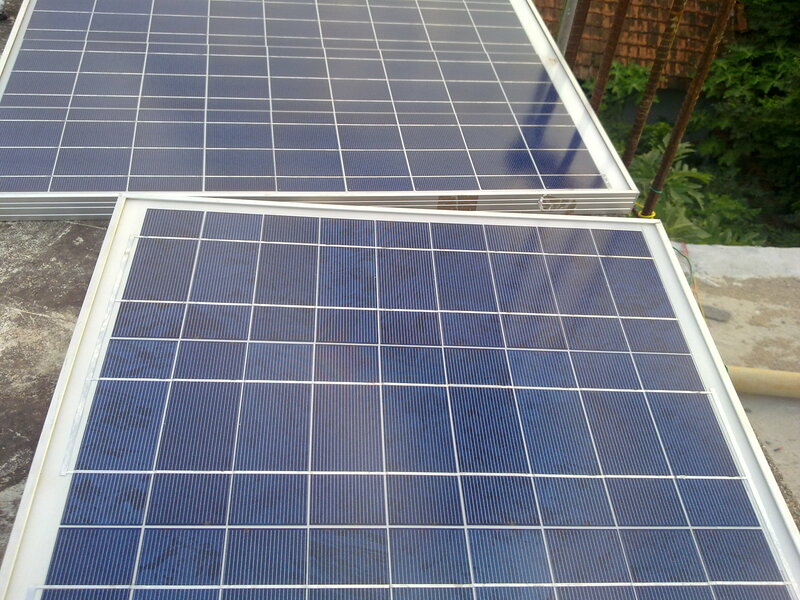 At 5:00PM, the solar panels came under a huge shade and it resulted in a drastic drop of output to 1A. Firstly (like a hungry person) constant current mode during which it takes in lot of currrent and charges upto 70% of the battery capacity. The rate of charge given by many manufactures is 0.15C where C is the Ampere hour capacity of the battery(so for my battery the safe limit is about 4.5A). This stage lasts for about 5-8 hours. The end of this stage reaches at 13.2-13.6V depanding upon the rate of charging and the battery voltage shoots up and has to be regulated by the charge controller to a safe voltage, typically 14.4V. This results in the constant voltage phase. In the second stage, (like a person who finishes his meal) the battery operates in constant voltage mode where in the battery voltage is maintained at a safe limit(14.4V typical) by the charge controller/ regulator. 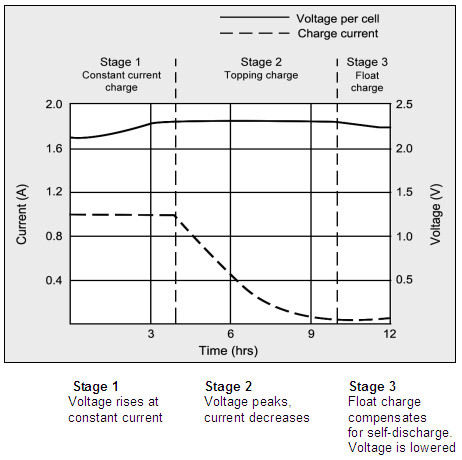 The battery draws a smaller current that exponentially decreases from the value of constant current stage to zero. When the current drawn reaches 3% of the value, the battery is considered as fully charged. This stage is called “topping charge” and it takes about 60% of the time for completing 30% of the charge! This is important for the life of the battery else the battery will stop accepting full charge. Thirdly, after being fully charged, the battery should be kept at “float voltage”. This is to compensate for the high self discharge of the battery which is 3-20% per month. If one looks at the second stage called “constant voltage” stage, the solar panel output is not being used fully resulting in wastage. You cannot skip the stage either, because it will result in reduction of the battery life. I’m currenly doing a project to handle this problem: I want to design a charge controller that will charge two batteries: one battery with low state of charge at constant current stage and another battery at high state of charge in constant voltage phase. This makes sure that the solar panel output is utilized fully. Any comments on this welcome!